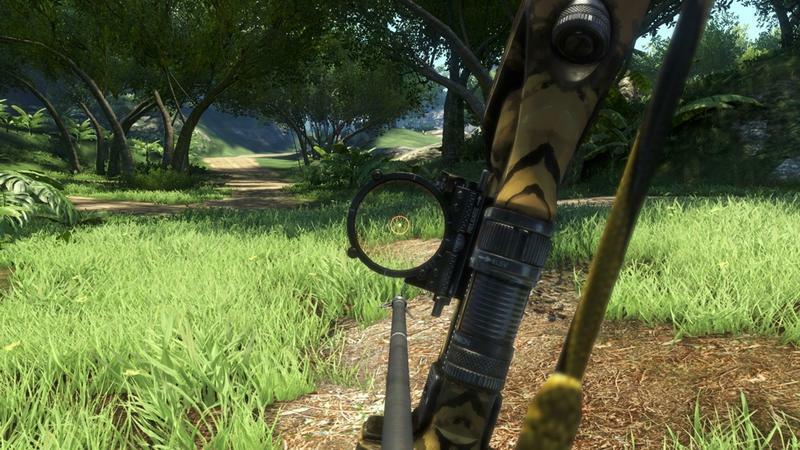 I was only a few hours into Far Cry 3, a few radio towers and enemy bases conquered, when I approached my first tiger. She was strolling through the Rook Islands jungle, untroubled by the herd of Tapirs grazing nearby. More importantly, she was oblivious to my presence. To get a better vantage point, I climbed a small hill about sixty yards from my target, crouched in the deep green brush, and aimed my sniper rifle. A car of Rakyat friendlies drove by. The setting sun turned the sky an array of pinks, oranges, and purples. I hit her in the chest, but it wasn’t enough to take her down. I aimed again, shot, missed. She quickly spotted my location, and immediately started sprinting right toward me. I panicked, turned, fell down a short drop off, reloaded, and tried to shoot again. But it was too late; the Tiger already had me pinned down, her jaws firmly clenched around my left forearm. I mashed the button being prompted on screen, jumped up, and tried taking her out. But she lunged, and I was down for good. That encounter confirmed my love for Far Cry 3 and highlights why I chose it over games like Black Ops 2, Halo 4 and Assassin’s Creed III. It’s been the little, unexpected moments like my failed hunting attempt that make the open world game so exhilarating. I’ve seen quite a few polarizing opinions about Ubisoft’s tropical paradise shooter from fans, but I definitely fall into the camp that thoroughly enjoys everything about the game (so far). One second I could be walking through the Rook Islands’ jungles and beaches, casually looking for lost WWII letters, and the next I’m running away from a group of Komodo Dragons. There’s nothing more terrifying than hearing a deep, menacing Komodo roar and not knowing where it came from. You’re not in control. You’re as much a predator as you are prey. Quietly conquering enemy bases with the Recurve Bow (with marksman sight attached) is just as exciting as crafting syringes and holsters. I haven’t touched much of the story yet, so I can’t chime in too deeply about how it unfolds. The main character, Jason Brody, is certainly trite and says some forehead slapping one-liners. 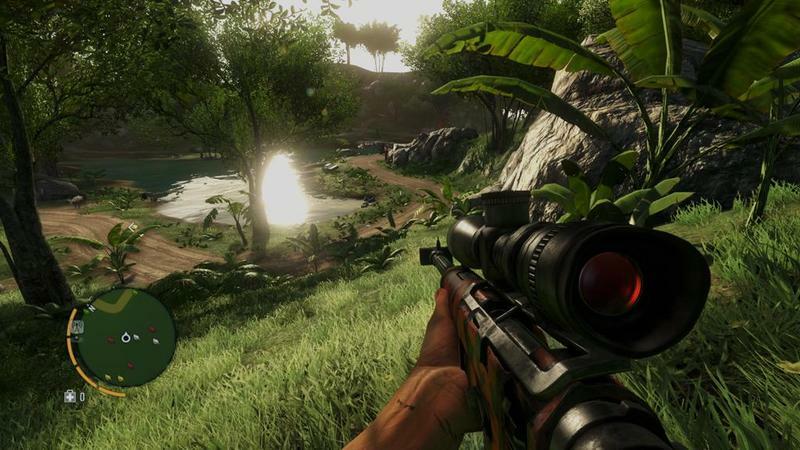 But I really don’t care, because Rook Islands, the world Ubisoft has created, is far and away the star of Far Cry 3. It’s a sweltering playground that’s as unpredictable as it is fun, and that’s easily its biggest and best feature. It’s impressive how seamlessly Ubisoft has players cycling through the game’s core mechanics. You can sneak, hunt, shoot, drive and explore all in the span of sixty seconds. I’ve already encountered many more tigers (and bears, sharks, snakes and even some buffalo), and each situation has played out different from the last. Tagging enemies with your camera is wonderful, and quietly taking them down is even more satisfying. That’s why, for me, Far Cry 3 is so much fun. I’m only a few hours in, and I can’t wait to activate more radio towers, find more hidden relics, take over more enemy bases. I haven’t even mentioned Vaas or the drug-addicted Dr. Earnhardt. But plot stuff is secondary in a game that allows players so much freedom. Just stay away from river banks, otherwise you’ll make for a quick and easy meal for the game’s saltwater crocs. I learned that the hard way.